Despite its widespread popularity and user base, Microsoft Office has few tools or features to assist in preparing files for output at a commercial printer. Fonts and graphics must be collected manually, and Office will not provide a list of the fonts or graphics needed. In addition, page setup information is not always retained, even when opened on a different computer with the same version and operating system. This can lead to text reflow problems and inconsistent output. 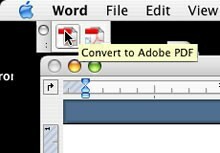 If you are using Microsoft Office to prepare a document for printing, it is recommended that you generate and submit an Adobe pdf that will retain all of your fonts and formatting.